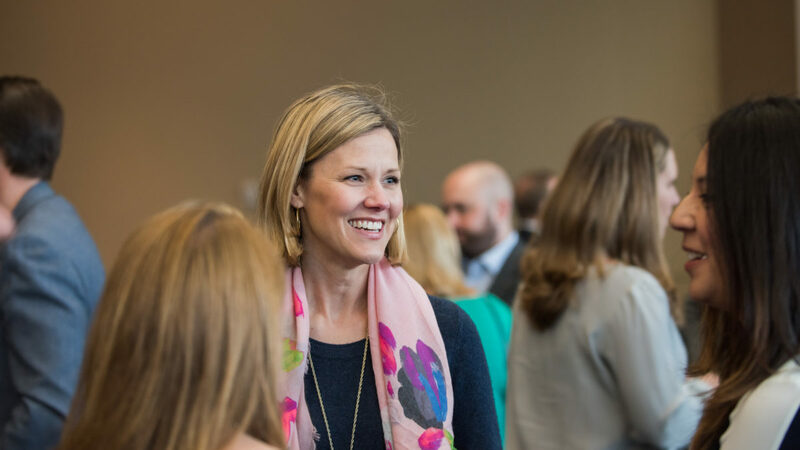 Dig deep, live in the moment, and appreciate feedback: Chief Strategy Officer Abby Wendel shares information about her leadership role at UMB, causes she’s passionate about and life and career lessons learned. What’s your favorite challenge in the workplace? My favorite challenge for my team and myself is to really dig deeper while exploring opportunities. I enjoy encouraging my teams to work independently and together—to think differently—so we can find the unique solutions that truly benefit UMB now and into the future. How do you get the creative juices flowing? I draw inspiration from a lot of different sources. Reading, for example, has always been a big part of my life. It’s amazing to watch my six-year-old daughter learn to read and to think about how the world will open up to her now that she has that skill. I also love to brainstorm with others, and as cliché as this will sound, the arts are a source of inspiration. While totally different from the world of business, the human stories told through theatre and visual arts serve as a tremendous source of inspiration that is ultimately relatable to a situation at work. And, sometimes I think just a change of scenery can help you see a complicated situation differently. Distance can be a plus. You’re clearly enthusiastic about the arts. Can you share more about this? I am passionate about community involvement and especially about giving a voice to the arts and theatre communities of Kansas City—the craft of story-telling is so important. There is so much power in sharing information, experiences and lessons in a creative way from both a relatability and learning perspective. Artists can express themselves in a unique and emotional way, while spectators learn and connect with meaningful situations while being entertained. Supporting the arts continued growth in Kansas City is something I’ve personally taken great interest in. Most recently, I completed a nine-year board position with the Kansas City Repertory Theatre‡, with the last three years as vice chair. During that time, I oversaw the strategic planning efforts, which included helping rethink and implement the organization’s approach to growth, while working alongside an outside consultant and the theater management. My husband and I also co-chaired the Kansas City Art Institute Art‡ and Design Auction last spring, which was the highest grossing fundraiser for the school, resulting in more than $500,000 in donations. We had so much fun supporting this great event! I’m also passionate about life-long learning and am fortunate to have been elected in February to the Board of Trustees of Avila University. High-quality universities are key to the long-term health of Kansas City, and I’m thrilled to be joining an institution that has been a part of our community for more than 100 years. When looking back, what piece of advice would you give to your 25-year-old self? Ski more. I lived in Denver throughout my twenties and was very committed to launching my career and completing an MBA, so I turned down a lot of opportunities to “play” with my friends. I probably figured I’d live in Denver forever and didn’t have to worry about not taking more time for adventure in the Rockies. The reality is that it is as important to live in the moment and enjoy yourself as it is to plan for the future. I’d be a better skier today if I’d taken that advice! What life lessons have you learned from your career? I’ll point to two: a dozen years ago I had a remarkable boss at the Federal Reserve‡. We had highly complementary skill sets even though we were very different people. We worked incredibly well together and were able to accomplish a lot in a few years. What I remember the most, however, is how much fun we had while working together. Never underestimate the power of a good sense of humor, especially in the workplace. Also last year, I went through a 360 review process, and to say that it was enlightening would be an understatement. Feedback is a gift. If you are lucky enough to receive it, learn from it. Allow yourself to feel the boost from confirmation of what you do well, and lean into the discomfort that will undoubtedly arise when trying to improve, because if you can close the doors on unwanted behaviors many, many more will open for you. * What’s in a list?